Affiliates plugin integration for AddThis – AddThis focuses on “Better Website Marketing” and provides “Website add-ons that help you get more shares, follows and conversions”. 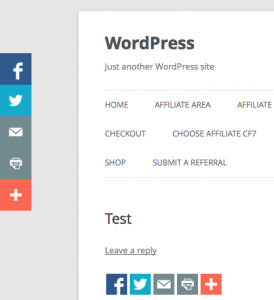 This plugin integrates Affiliates Pro and Affiliates Enterprise with AddThis and their Smart Website Tools by AddThis WordPress plugin. With Affiliates Pro or Affiliates Enterprise and the Smart Website Tools plugin, the extension requires no specific setup – URLs to pages shared are converted into affiliate links automatically when affiliates are logged in. good day, I am a newbie and I do not program, however I created the page in wordpress and I only need commissions for affiliates, I need advice to decide what to buy. Question 1. The affiliate license for $ 59 is per year? Question 2. Install affiliate and do not bring fashioned pesos? Can we enable weights? Question 3. The language to the public come in Spanish? Question 4. We are a representative agent not sellers then we do not charge money, our work would be the following: a customer chooses a product, clicks on acquiring with zero value, without paying, we ask for the documentation and chat we close the sale , then, the click to buy does not mean that the sale is closed. How can I configure the system so that the commission does not assign it when I click buy, but when the sale closes? #4 I’m not sure about this case, but you can create referrals manually – maybe you might want to consider one of the integrations with Ninja Forms or Formidable Forms if you just want to track leads. I thought you could work some kind of customization in order for it to work with this kleo share button. And can the “add to any” addon work with it. Hi, please send me an email to antonio[at]itthinx[dot]com with a copy of your theme, and I’ll try to integrate with Affiliates, but I can not assure you that I get it, since each theme works differently. The share buttons that you have in your products, are not added by the AddThis plugin. These buttons are added by your Kleo theme, this is the reason because the affiliate param is not automatically added. Maybe youcan disable the theme’s share buttons and enable the addthis buttons. Am not sure the sharing features on my theme is addthis. Can this work for other bookmark features. You also have available the integration with AddToAny. If you give us an url, maybe we can find the system that your theme uses. It does not work as expected on the product pages of woocommerce and also pages of wordpress. please use the forums for support questions. On the topic, please give us an url to have a look at this. Ok, Thank you. I have the free installs already, I will get the up to 5 site license in a couple of days. Hello, I want to get affiliate pro for this particular reason, the addthis integration. Would this work for woocommerce products? I would like it to share woocommerce products to social networks. If It can be done, I would like to get this. Yes, using this integration, when an affiliate uses the addthis button (in products/pages/posts …), the link shared includes the affiliate param.